There’s a nice variety on Something Wicked, including, for my money, one of the band’s absolute best songs in “Burning Times.” The thrash vibe is very apparent on a number of the tracks, most notably the album’s most aggressive tune, “Disciples of the Lie.” But the softer side of the band shines as well on one of my favorite Iced Earth ballads, “Watching Over Me,” a melancholy yet uplifting ode to a fallen friend. 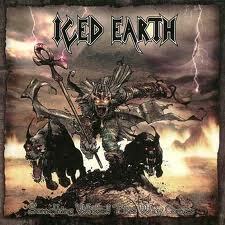 The album, of course, also introduced Iced Earth’s mascot Set Abominae with the final three songs, which laid the groundwork for the much less impressively executed Something Wicked concept records – Framing Armageddon and The Crucible of Man – which arrived years later. This record offered a lot of promise for stabilization of the band, but as we know, the door continued to revolve with Tim Owens coming in for a couple of albums, Barlow returning, and now, Stu Block taking over vocal duties for the latest album. And we won’t even get into the other positions in the band. Still, for the brand of American power/thrash that Iced Earth plays, it doesn’t get much better than Something Wicked This Way Comes. 4. Bruce Dickinson, The Chemical Wedding. The second collaboration between Dickinson and Adrian Smith didn’t impress me quite as much as 1997’s Accident of Birth, but it’s still an outstanding record. Many fans consider it better than Accident. 5. Rob Zombie, Hellbilly Deluxe. Rob Zombie’s first solo effort after the dissolution of White Zombie was different, yet familiar. It’s a record full of great hooks. He’s yet to match it, and likely never will since it seems that music is secondary now. 7. Marilyn Manson, Mechanical Animals. After 1996’s Antichrist Superstar, which might be the last record ever to scare parents, Manson took a different direction. This spacey record is mellower, but very interesting. It owes much to Bowie. 8. Anthrax, Vol. 8: The Threat is Real. I’m on record as a fanboy of the John Bush era of Anthrax, and I believe this is one of the underrated records of that era. 9. Judas Priest, ’98 Live Meltdown. Despite the absence of Rob Halford, this remains one of my favorite live Priest records. It sounds great, and Tim Owens sings the hell out of songs old and new. 10. Godsmack, Godsmack. This was a promising debut from a band that’s had its ups and downs, a mixture of Alice in Chains and Black Album-era Metallica. 11. Monster Magnet, Powertrip. The stoner rockers’ breakthrough record is also the band’s strongest, in my opinion. It deserves a spot on this list for “Space Lord” alone. 12. Slayer, Diabolous in Musica. A lot of people didn’t like this record because Slayer took a few chances here and there with sounds that weren’t typically Slayer. That’s why I did like it. 13. Kid Rock, Devil Without a Cause. Stop rolling your eyes. This was a fun record all-around, and though he’s become boring over the years, I still like it. 14. Metallica, Garage Inc. This one’s a bit of a cheat. I chose it not for most of the songs that were newly recorded for it, but for collecting all of the early covers in one place. 15. Black Sabbath, Reunion. I put this last simply because the new songs on it weren’t that great, but I thought it deserved a spot just for historical value. Other albums from 1998 that just missed the list: Union, Union; Amon Amarth, Once Sent from the Golden Hall; Dio, Live Inferno; Opeth, My Arms, Your Hearse; Amorphis, Tuonela.